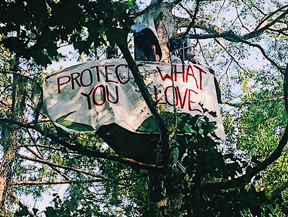 FROM nobbp.org 8/14/18 — Here in the bayous of Louisiana, our water and way of life is under threat, and we need your support. Energy Transfer Partners (ETP), the very same company behind the notorious Dakota Access Pipeline (DAPL) , is trying to build a 162 mile crude oil pipeline across Louisiana called the Bayou Bridge Pipeline (BBP). This is an open call for all water protectors, kayaktivists, radical sailors and water going folk to join us on the frontlines as we fight the tail end of the Dakota Access Pipeline in the swamps of Louisiana. 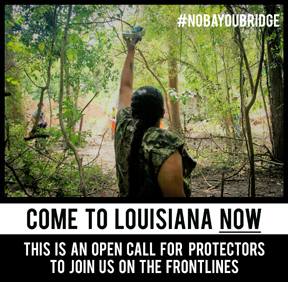 If you are interested in stopping the Bayou Bridge Pipeline, make plans to come to Louisiana NOW. Need to email or contact camp prior to coming. BBP will pollute our water, crossing an astounding 700 bodies of water including Bayou LaFourche, a critical reservoir that supplies the United Houma Nation and 300,000 Louisiana residents with clean, safe drinking water. BBP violates indigenous sovereignty. Along its path of destruction, BBP would impact sacred mounds and threaten drinking water of the United Houma Nation, a tribe that has been seeking federal recognition for decades. Neither the United Houma Nation nor any tribe of the gulf south has been consulted nor given consent for the construction of this pipeline. From — Lakota People’s Law Project It’s Not Over! Leaked documents reveal that TigerSwan, a private security firm hired by DAPL parent company Energy Transfer Partners (ETP), operated without a license in North Dakota. TigerSwan also employed unlawful, paramilitary style tactics to suppress the movement by targeting, surveilling, and provoking the peaceful and prayerful water protectors at Standing Rock. Use the form on the Lakota People’s Law Project site to ask North Dakota’s Attorney General and Morton County’s State’s Attorney to drop the charges against water protectors and hold TigerSwan and ETP accountable by making them pay for the state’s costs resulting from law enforcement actions at Standing Rock. Energy Transfer Partners contracted with private paramilitary organization TigerSwan to surveil and suppress water protectors. Is Canada the Next Standing Rock? Petition to Army Corps of Engineers, Colonel John W. Henderson, Commander and District Engineer, Omaha District and Jo-Ellen Darcy, United States Assistant Secretary of the Army created by 13 year-old member of Standing Rock Sioux Tribe. 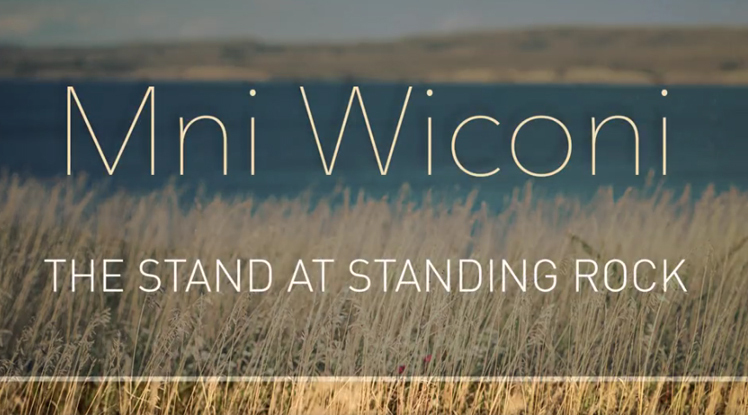 Send a message to your representatives in the House and Senate and let them know that you do not accept the Dakota Access Pipeline going through sacred lands without diligent environmental oversight previously requested and promised. Ask them to deny support for all pipelines and support alternative clean energy. Keystone XL Pipeline — Bringing Oil to Texas? *Environmental Activists are going to use the State Review Process in Nebraska to block the pipeline. Keystone still does not have a legal route through Nebraska. MORE TO COME. *Click Image to view film. Drone Footage of Dakota Access Pipeline Approaching Missouri River from Paulette Moore on Vimeo. The formatting on this page can become a bit wonky at times as the feeds change the shape of the layout. All the feeds connect back to the original source. *We’re hoping eventually to create a website for this with more ways to connect and share prayers and information.